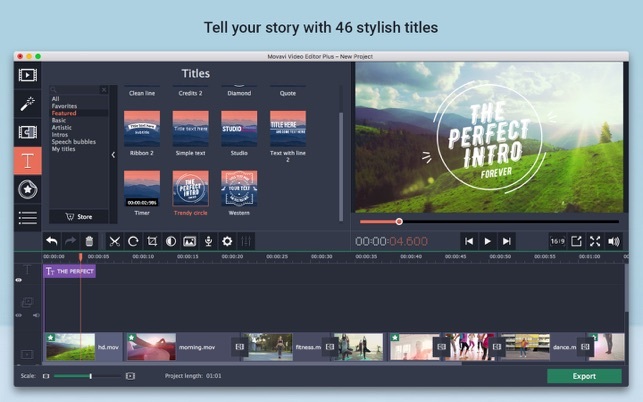 Movavi Video Editor Plus is a handy way to share your memories and feelings with your loved ones. Make memorable movies about birthdays, weddings, holidays, and other life-enhancing events – even if you don’t have any video editing experience. Get movies ready for an audience in minutes. You just need upload videos, photos, and music – the program will do the rest for you. Make your own videos with music, add titles and callouts, join shorter clips with transitions. Use filters and special effects to create a stunning movie. Overlay objects and make them move on the screen. Add keyframes so titles, stickers, callouts, and even whole clips seem to appear and disappear in the movie. Shoot videos against a green screen, then replace it with any background you want. Make videos less shaky by adjusting the stabilization controls. Normalize the volume in your videos, get rid of background noise, and fine-tune the equalizer settings. Work with any multimedia types and export the results in any format: MP4, MOV, AVI, MPEG, GIF, MP3, FLAC, and more. Save videos for viewing on mobile devices – iPhones, iPads, and more. Enjoy seamless export to YouTube and Google Drive directly within the program. Please send questions and comments to our Support Team at http://www.movavi.com/support.html any time. We’re always happy to hear from you! 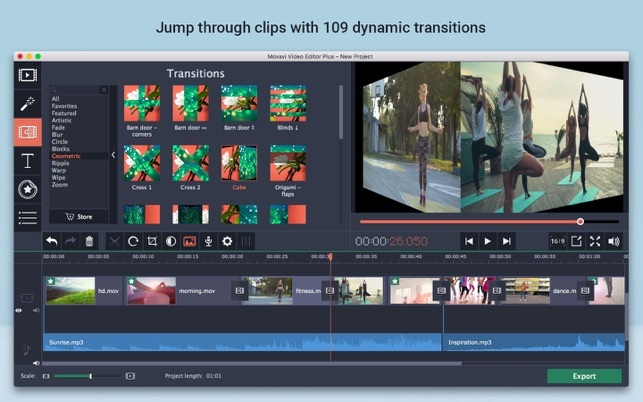 Movavi Video Editor Plus requires a subscription. You can choose between monthly, 3-month and year subscription plans. There’s also a 7-day trial, so you can try Movavi Video Editor before you commit. 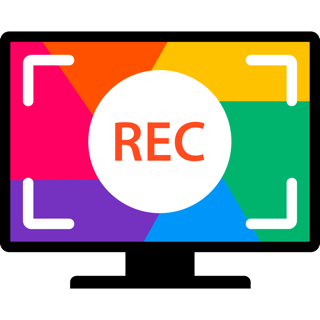 A trial version has a watermark over the exported video. 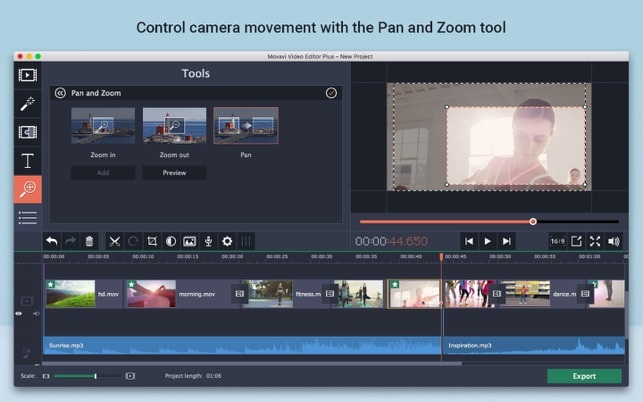 Duration and price of each subscription are displayed in Movavi Video Editor Plus’ storefront at the time of purchase. Payment will be charged to iTunes account at confirmation of purchase. Subscriptions automatically renew unless auto-renew is turned off no later than 24 hours before the end of the current period. Subscriptions and auto-renewal can be managed/turned off in the iTunes account settings. Any unused portion of a free trial period is forfeited as soon as a subscription is purchased. 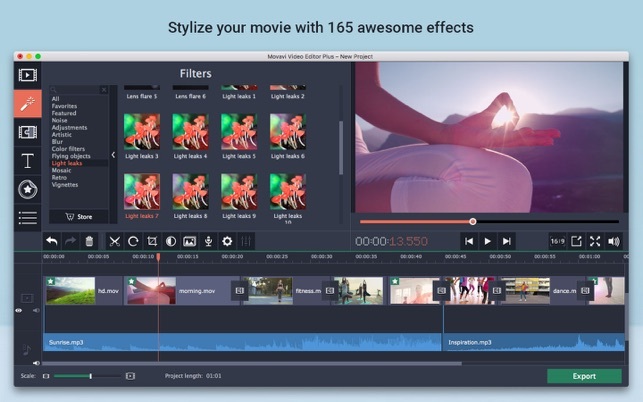 Great Video Editing Software and at a Great Price! 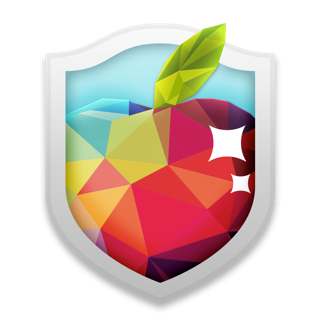 I just bought me an Apple iMAC this past Christmas . The best decision ever made. Since I take a lot of pictures and videos when my wife and I travel to Europe I was using another video editing software in my slow Microsoft HP Computer. iMAC came with iMovie so I gave it a try. It does not work at all. it kept getting stuck and many times the application never came back from spining. 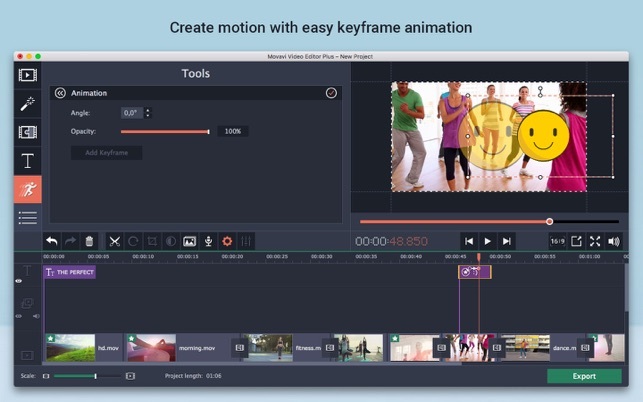 So I trashed it , went to the Apple Apps Store and found this GREAT VIDEO EDITING SOFTWARE "Video Editor Plus Movavi" It's very simple but intuitive. Not like iMOVIE too complex. Movavi works pretty much like my old Wondershare in my Microsoft computer but much less expensive. I was so happy with the video I created that I decided to buy it for a year instead of using their free trial. I recomend it to anyone who just want to create a decent videos, fast but with all the glitters available if you need it. My video finihed just now and it started when I start rating this product about7 or 8 minutes ago. Thank you to the creator of thisVideo Editor Plus Movavi. Now, i have to start all the way back over again for the 4th time and hope i get a decent video… if not, i will be canceling my subscription, deleting this app, and finding and paying for another one thats worth the money… THIS IS ANNOYING!!!!! Could you please contact our support via support@movavi.com and we'll help you to fix the issue. I would work on my videos for hours/days getting them to look just how I want it too. Once i save the video to retrieve some audio from another video (VID#1) that got corrupted, i reopen the saved file and it reads corrupted on all 3 videos (projects) I’ve tried to edit. I’m going to try and reopen but im about to give up on this app, because other then it completely deleting my Video (leaves audio, tansitions, all text created in the app) it works great and I enjoy the features, but all that is worth nothing if I go to reopen and its deleted. I use my galaxy s8 camera (downloaded) and macbook pro camera.